Conservative radio commentator Rush Limbaugh says the mainstream media attitude on President Barack Obama is that he is too big to fail. What CNN has planned for the night of April 29 is one of several signs that could be the case. According to an April 19 report from the Associated Press, CNN has a big night of coverage planned for Obama's 100th day in office that will deviate from its normally scheduled programming. 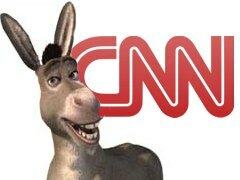 "CNN is marking President Barack Obama's 100th day in office with prime-time coverage that will recall last year's primary and general election nights, right down to John King's magic wall," the AP article said. "The network says it will compile a national report card of Obama's performance, using opinion polls and a series of viewer surveys. The big night is April 29, a week from this Wednesday, pre-empting regular programming." The AP report said only ABC is the only other network that has made their first 100 days of Obama programming and will feature segments on its "Good Morning America," "World News" and "Nightline" programs. Obama's first 100 days have an added importance according to the story because of "the two wars and economic meltdown." CNN will showcase its on-air talent as it did on Election Night 2008. "[John] King, who used a giant touchscreen during the election to keep track of polling data, will use it again to show where money is going from the economic stimulus plan, he said. Bill Schneider will review polling data. Wolf Blitzer, Anderson Cooper and Soledad O'Brien will join King as the network's on-air leaders," the story said. CNN came under fire recently after CNN correspondent Susan Roesgen interrupted one of the Tea Party protestors on April 15, and slammed the event for being "anti-government," "anti-CNN," and "not really family viewing."